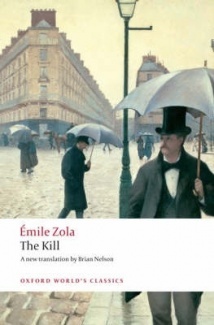 The Kill (1871-2) is the second novel in the publication chronology of Zola’s Rougon-Macquart cycle, but it is third in the recommended reading order. It’s the story of ‘uncontrollable appetites’ let loose by the Second Empire, and where His Excellency Eugene Rougon (1876) is about the lust for power, The Kill is about the lust for money and the lust for pleasure. For the main male characters, Saccard and his son Maxime, these drives for excess derive from their Rougon heredity: all the legitimate offspring of the matriarch, mad Adélaïde Fouque, prosper – but at a cost. They are upper-class, educated, ambitious and generally successful but they are characterised by a lust for power, money, and excess. Renée, brought into this milieu by her marriage to Saccard and her love affair with her stepson Maxime, shares this love of excess through the influence of a domestic environment which – in Haussmann’s new Paris – has no boundaries. The Oxford Classics edition has an introduction by its translator, Melbourne’s own Professor Brian Nelson of Monash University. As I found before when reading The Ladies Paradise, the introduction is well worth reading for the way in which it illuminates Zola’s wider concerns. In particular, he explains the political significance of Haussmann’s Paris. Napoleon III set up this program of modernisation for the city in order to establish his authority and to legitimise his rule – he had been elected President in 1848 but staged a coup d’état in 1851, assuming the dictatorial powers of an emperor when in fact his only claim to any throne was that he was the nephew of Napoleon I. He needed to impress. The relevance of the Haussmanization of Paris for this novel is that it enabled the emergence of property speculation. The project was funded by the government compulsorily acquiring all the private land on either side of the route of the new boulevards, (displacing hundreds of thousands of people), and then selling it off to property speculators. Developers then built apartment blocks to precise new building regulations, providing new and better housing but at much higher rents. It was all ‘fantastically expensive’ and the financing was expedited by a ‘mixture of direct grants, public loans and ‘creative accounting’, using all the apparatus of the emerging capitalist system and causing ‘wild speculation in real estate and public works’ which included ‘expansion of the railways and in the coal and iron industries’. Towards the end of the novel, when Maxime has tired of Renée and is about to succumb to an arranged marriage because it improves his financial status (and the girl is conveniently doomed to an early death because of consumption), Zola depicts the conspicuous excess that defined the corruption of Parisian society. Everyone who is anyone turns up at the Saccard mansion for a series of tableaux, a lavish form of entertainment usually based on scenes from well-known myths or plays. It is followed by an extravagant ball. The tableaux is an adaptation of the myth of Narcissus and Echo. The director is a Prefect, M Hupel de la Noue, and he has spared no expense in exercising his intellectual pretensions (though it’s not in very good taste). It stars Maxime as Narcissus dressed as a hunter in search of prey and Renée dressed in a scanty outfit as Echo, who is trying unsuccessfully to seduce him. In the first scene she takes him to Venus in the hope that Venus will help her, but he is disdainful. In the second scene she tries to tempt him with the riches of Plutus but that fails too. In the third scene, Plutus and Venus take their revenge, turning Narcissus into a flower, leaving Echo to die, her love thwarted. There’s a lot of gold and a lot of flesh on display. In between the scenes, the men in the audience talk business and politics, relating one financial scandal after another so that the reader is left in no doubt that the entire edifice of Parisian wealth is based on a speculative ‘house of cards’. After the tableaux, there is a monstrous ball. Renée reappears dressed up as a Tahitian, wearing very revealing tights and a transparent blouse which leaves nothing to the imagination. Some of the ladies are a bit shocked, most think it’s a great joke, and (of course) the men are all delighted. The house is decorated as if it’s a forest, and the musical instruments are mostly brasses i.e. an allusion to hunting horns. The guests hurl themselves after the food, grabbing, gorging, and ‘capturing it’ in the crush of greedy gluttony. There is a sequence of dances in which the men as hunters go after the women as prey. It’s all very undignified and vulgar and everyone ends up dishevelled and drunk. As Nelson explains, Zola uses the sense of disorientation in the new city and the way the boundary between domestic and public life has been blurred to illuminate the way that the architecture of family life collapses along with the demolished buildings. The perversion of the characters represents the diseased society: people – especially women – have become commodities. And as Balzac so often also noted, the marketplace rules, and women and their ‘dot’ (dowries) are part of the apparatus of a man with social and economic aspirations. The tone of the novel is rather lofty: Zola has no affection for any of these characters, not even poor little consumptive Louise, who is the nearest there is to an innocent. Zola provides a tragic back story which accounts for some of Renée’s salacious behaviour, but there is little compassion for her and the author can’t resist telling us that her only legacy is a massive couturier’s bill. Indeed, the heroine of this story is someone the reader will barely notice, a prudent, discreet woman who saves up her earnings so that she can abandon Paris to its corruption. Yet even she is corrupt, in turning a blind eye to behaviour that would generate strong disapproval even in the anything-goes 21st century! The translation by Brian Nelson is excellent. Trust me, if you want to read Zola, it is worth paying for a modern translation and a reader-friendly introduction that sets the work in context. Check out Nelson’s style with a short intro to Zola’s intentions at the OUP Classics blog. PS Oxford is just about to release its latest Zola translation in its Oxford World’s Classics series: Money, the 18th novel in the Rougon-Maquart cycle. The translator is Valerie Minogue, and this edition will be the first unabridged i.e. uncensored edition in English. Valerie Martin is the President of the Émile Zola Society in London, and the novel is due for release on March 13th 2014. This commentary is by Lisa Hill, and cross-posted at ANZ LitLovers. Or free from Project Gutenberg (in French) or (in English) in The Works of Emile Zola. This entry was posted in 1871, Émile Zola, Commentary, English, Lisa Hill (ANZ LitLovers), Nelson, Brian, No 3 and tagged Émile Zola, The Kill. When I read it I was amazed at how decadent it was. Saccard, in comparison to some of the other characters, comes across almost puritanical – except for his lust for money. It looks like you’ve timed it right with Money being the next one in your reading order and a new translation coming out soon. It may seem a bit flat after The Kill but it’s a good book. Decadent, yes, indeed. Just chatting about this book elsewhere, I was amazed to see that someone studied it at school in France. I bet that would never happen in our more puritanical countries, eh?